Security topics for web services. After learning something about secured web services, we can cover some topics that build a stronger foundation, user account initialization and management, and claims management. We’ll need some answers there before moving on to next week’s topics. Why is this useful now? So that we can initialize a new app with one or more user accounts, in code. The security-aware project templates, for web app and web service projects, are configured to enable user account creation, with no code changes. However, the result is unsatisfactory, because you have to really know what you’re doing, it takes some effort, and the resulting user account(s) do not have the configuration settings (e.g. claims) that are typically needed in a new app. So, it would be nice to programmatically create new and fully-configured user accounts, when the app loads for the first time. Here’s how we will do that task. First, recall (from above) the sequence of steps that happen when an app loads into server memory. We will plan to do our user account creation task at the end of that sequence. More about that soon. Here’s some sample code. As its comment states, change any of the data below to better match your app’s needs. Notice what we just did: We created a new user, with some very specific claims. We are saying that the app will have a role claim, UserAccountAdministrator, which denotes a special role or status. Now, open and edit the ConfigureAuth method in the startup class (in the App_Start\Startup.Auth.cs source code file). Today and this week, we will break new ground in our course work. It’s based on the claims topic that was introduced before the study week break and Assignment 7: We need to design a way that we can work with and manage custom claims. First, let’s re-visit claims, specifically the standard and well-known claims. Yes, there are claims for names and identifiers. And, we have role claims, which were created to help transition knowledge from the past. Attempt to limit the number of roles that are created in an app. There should be a fairly small number. Over time, the number of roles should not grow too much or too frequently. A role should be used to broadly describe a fairly large number of users who share a access- or use-oriented goal in your app. For example, a public-facing app could have an Employee role, a Customer role, and an Administrator role. Consider a role to be a coarse-grained way to design large or overview access or use categories. Instead, capture these purposes by using custom claims. Is this a best practice? No. This is guidance. We will experiment with this approach, and see what happens. It is reasonable to expect that the number of custom claims – their types and values – will be numerous in a busy app. As a result, we should attempt to introduce some structure and limits in our initial design. That way, we strike a balance between having a detailed roadmap to a destination, and having no idea where to go next. In an app, we often want to control access to a resource. A high-level way is to use a role claim. However, we often need a finer-grained approach. For example, consider your role as a student here at Seneca. If an app had resources that were intended to be accessed by School of ICT students, should we introduce a role? Probably not, for several reasons. First, we would then be tempted to create roles for each and every other School at the College, so there would be dozens. Next, it doesn’t add much to the overall conversation about “roles” and their membership. How about using a claim type of “OU”. We borrow this concept from directory services, and specifically an organizational unit, or OU. The concept of an OU is quite flexible, and can help solve problems from many different knowledge domains. In an app, we often want some activities to be done only by those with permission. Again, a high-level way is to use a role claim. However, a medium-sized app could have many resources with dozens of activities possible (familiar CRUD activities, as well as commands). Again, a poor match for roles. This scenario is also ideal for using custom claims. What claim types and values should we design for this purpose? How about using a claim type of “Task”. In Assignment 7, we used “Activity” as a claim type, but it could be argued that “Task” is a better word to use in the English language. Some apps need user account data that is not used for the access control and activity permission purposes discussed above. Maybe the data expresses a preference, maybe it’s descriptive, maybe it’s used for interaction personalization – the possibilities are many. Again, this scenario is ideal for using custom claims. What claim types and values should we design for this purpose? Well, we do not offer any prescriptive guidance here. However, in an app, as you gain experience, if you can blend your use of role and custom claims – including OU and Task – then the app’s reason-for-being will probably suggest some useful descriptive or personalization claim types. For access control, we suggest using a custom claim type of “OU”. For activity permission, we suggest using a custom claim type of “Task”. What values are allowed for the role claims? Anything? In any format (UPPER CASE, lower, MiXeD, with typoes typos?) Or, a reasonably-limited number of values, with an agreed-upon way to manage the list of values? Next, what types and values are allowed for custom claims? We are probably comfortable starting with OU and Task claim types, but we have the same issue with their values. The red-outlined entities – AspNetUser and AspNetUserClaim – are the most important to us. A simple one-to-many association – one user can have zero or more claims. However, there’s no “master list” of claim types or values. No restrictions. Whatever we create in code – when registering a new user account, or later – will be stored. Which may not be ideal for an app. So, maybe we should design a “master list” of allowable claims. Then, we manage the creation of claims, during the user account creation and management activities, so that we have some guidance and best practices to rely on. Open the code example ManageClaims, and follow along. The code example implements many of the tasks discussed below. Let’s create a class named “AppClaim”. We can add its source code to the existing IdentityModels.cs file (and add its DbSet<TEntity> property in the ApplicationDbContext class). Next, in the Controllers folder, create a source code file to hold the resource models. Create “add” and “base” resource model classes. Install AutoMapper version 4.2.1, and add a config source code file (in the App_Start folder) to hold the create-maps. Back in the Controllers folder, add a Manager class, and an AppClaims (Web API) controller. The Manager class will have methods for the common CRUD tasks. In addition, it will have extra logic and some extra methods to support the claims management process. Note… Study the Manager class in the code example to learn more. It has defined many/most of the tasks, but not all are implemented yet. The Controller class will support the common use cases (e.g. get-all, get-one, add-new, etc.). It will work only for the “user account administrator” user – therefore, it must be protected by a suitable [Authorize] attribute. Note… Study the AppClaimsController class in the code example to learn more. Similar to above, it implements some of the basics, but not everything yet. At this point in time, we will have the basic ability to manage a “master list” of custom claims. Now, we need to use that “master list”, during user account registration tasks. In the past, you have worked with the “account” web service controller to create/register new user accounts. That process does not change much. Open and study the ManageClaims code example as we discuss this topic. In summary, we must validate the requested claims, by looking at the master list. If a requested claim is NOT on the master list, then the create/register attempt will fail. The existing code in the account controller’s Register() method shows how to get started doing this. The code will loop through the requested role claims, and validate each one against the master list. Is the method complete? NO. It needs code that will loop through the requested custom claims. We’ll probably do that as an in-class exercise. The other important topic for today is user account management. At this point in time, you have some experience with creating/registering new user accounts in a web service. And above, you just learned how to validate the requested claims against a master list of allowable claims. Does the project template include the built-in ability to manage user accounts? No. As you know, the ASP.NET Identity system stores user account data in the database-backed persistent store. Therefore, it’s fair to ask whether we use the traditional data context (ApplicationDbContext) to work with user accounts. The methods marked with an asterisk ( * ) are used in the account controller that’s already in the template. That controller is designed for some very specific tasks, but it was not designed as a general-purpose tool for user account administrators. Instead, it was designed to help one user create/register a user account, and then manage it (e.g. change password etc.). ALWAYS prefer and attempt to use the ASP.NET Identity API – mostly the UserManager class – to work with user accounts and claims. There are a few tasks that the API does not expose. In those situations – if you’re careful – you can go around the API, and work with the data context. But please prefer and attempt to use the API. While going through this section, open and study the ManageUserAccounts code example. We established (above) that the existing account controller was not designed as a general-purpose tool for user account management. We could add more methods to that controller, but maybe we should create a new controller, with backing methods in the Manager class. In addition, let’s continue to use the long-established design practices – including resource models – when we’re working with the ASP.NET Identity entities (user accounts and claims). Look again at the ASP.NET Identity entity for a user account. Its class name is ApplicationUser (as seen in the IdentityModels.cs source code file). 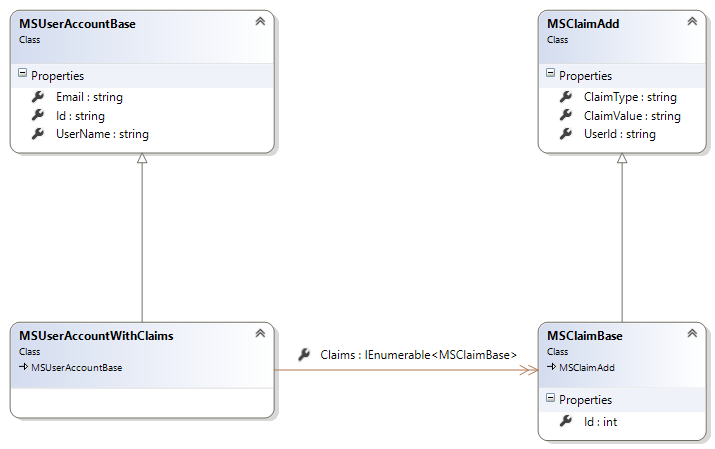 The claims collection data type is IdentityUserClaim, which has useful properties, e.g. ClaimType, ClaimValue, UserId. One aspect of the ASP.NET Identity entity design is that the IdentityUser has a to-many association with IdentityUserClaim. This makes sense, in that a user account will have a collection of zero-or-more claims. However, the IdentityUserClaim collection (as a whole) will actually have claims that have the same ClaimType and ClaimValue, differing only in their Id and UserId. That’s by design. So, in the future, if you’re looking for “a claim” that matches a given ClaimType and ClaimValue, there may be more than one match. In other words, the collection could hold dozens (or more) claims, for different users, with (for example) a ClaimType of “role” and a value of “student”. We will NOT create an “add” resource model for a user account. The existing RegisterBindingModel (used by the account controller’s Register() method) already fulfills that purpose. 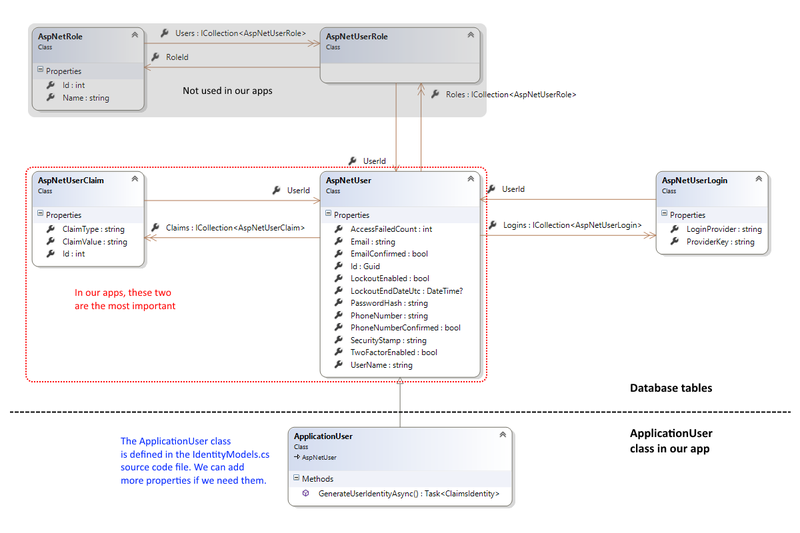 Here’s a class diagram. Click to open the image full-size in a new tab/window. Notice that we’re typically working with string identifiers. As a result, we will be using attribute-based route definitions for most of the controller methods. Notice also that the attribute-based route definitions embed the string identifier within the URI, instead of placing it at the end of the URI. This will lower the error and “not found” rate, because users/requestors don’t have to worry about arcane web server and runtime URI processing rules. In the Manager class, notice the UAGetAllBySurname() method. It fetches the user accounts, from the store, into memory, before querying. That is a common pattern when using the ASP.NET Identity API. If you ever attempt to do a repeating task, or a sub-query task, and receive a “data reader still open” error message, then you can solve that by using this pattern. Notice that the code example has only “get” methods, but we will want to work with claims (add, change, remove) in a real-world app. We’ll leave that work for Assignment 8, but we will discuss it during today’s class/session.